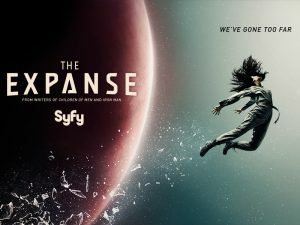 The Expanse is halfway through its second season on the SyFy channel, but Kyle Willoughby and Claire White can’t wait any longer to talk about it. Kyle takes a trip down the gravity well and gives some perspective on just how well the show handles the nitty gritty of space travel. Claire explains how this meticulously planned out solar system began as a video game pitch and eventually became a critically acclaimed series of novels. Our hosts conclude with their thoughts on the show, how it compares it to the books, and the excitement it inspires in the scientific community.